Besides the several plot holes–which I now know come standard in a Maze Runner film–the main reason why I don’t love the first Maze Runner as much as I could have is because it ends so abruptly. It leaves us hanging with little-to-no answers. But if I had the opportunity to watch the sequel directly afterwards, I wouldn’t have been so disappointed. The first installment is really enjoyable. They keep you stringing along with this giant mystery, and the process of getting you there is creative. The sequel, Maze Runner: Scorch Trials, answers a lot of questions posed in the first film, but keeps enough hidden to make us want to know more. 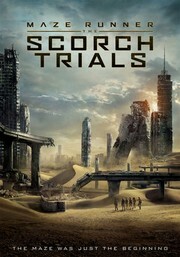 This film takes place just after Thomas (Dylan O’Brien) and the rest of the Gladers have escaped from the maze. They are taken to what they think is a safe haven. They don’t know what to believe after they discover weird things happening behind closed doors. After escaping, they must figure out what the next step is while they try to survive the elements of nature, along with mutant humans who are trying to eat them. Although enjoyable, the first film features a lot of talking and standing around, which makes its charisma all the more impressive. Maze Runner: Scorch Trials is none of that. It is constantly moving. It’s a road movie, really. And the tone is different from the first, too. The plot holes in this one, while not necessarily as detrimental to the end result, are still distracting enough to take notice of during the movie. However, there is one that may partially unravel the final 15 minutes of the film. Don’t get me wrong, the filmmakers sure know how to keep the audience involved, but sometimes it borders on manipulative. Certain situations are included that unnaturally move the story in a certain direction. If it weren’t for the rampant porousness and the directorial mishaps that led to it, this would have been one of my favorite films this year so far. However, I still loved the movie. After the last Hunger Games installment, this Maze Runner series is becoming my new favorite young adult post-apocalyptic film franchise.